How do you support people in a workshop or on a building site where you can't carry bags of books around to revise from? How to you persuade teachers in practical and vocational subject areas to invest time in learning how to use a content creation package like Xerte toolkits? How do you convey a lot of information in an easy to understand way to a group of very busy people at an international Bookfair? Als je in de zorg werkt, moet je zorgvuldig kunnen rekenen. In de beroepspraktijk word je dagelijks geconfronteerd met omrekensommen die van levensbelang kunnen zijn. 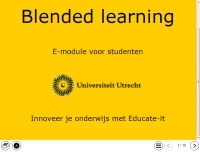 Met deze elearning module leer je op welke manieren je omrekensommen kunt uitrekenen. Dit leerobject gaat over injecteren, tabletten, injecties, zuurstof en sondevoeding. This Learning Object was created in 2014 by students at Newman University. The aim was to produce an online learning object for counsellors which would explain to them the field of Health Psychology. Rather than explain further, try it out for yourself!